We’ll start with one of the strangest items I’ve ever reviewed in my decades of writing about comics. It’s a 48-page graphic novel, published in a large 9.5 x 12.3 inches hardcover edition, lacking a beginning, a middle and maybe even an end. 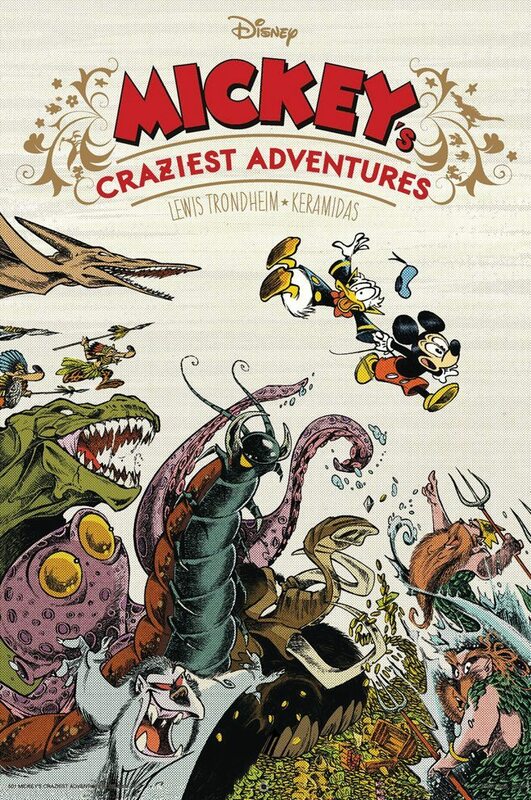 Published by IDW, Mickey’s Craziest Adventures by Lewis Trondheim and Nicolas Keramidas [$14.99] purports to be pages from a “lost” Disney classic. According to the book’s introduction, Trondheim and Keramidas came across about forty issues of a Disney comic from the 1960s, which had never been archived at Disney and was published on a regional basis only. It is claimed to have been a spin-off from Walt Disney’s Comics and Stories called Mickey’s Quest. However, the collection they found was not complete. “Mickey’s Craziest Adventures” was a series of single-page comics that appeared in Mickey’s Quest. They ran from May 1962 to February 1969. Delighted by the pages they did see, Trondheim and Keramidas decided to restore them for publication. Even if this strip was not complete, they figured the pages they did have should be preserved for posterity. I so wish that story were true. But the alternative is pretty cool, too. Trondheim and Keramidas (with colorist Brigitte Findakly) crafted 44 gorgeous and wildly imaginative full-page strips. Their “story” begins with “Chapter 2″ and continues with chapters 4, 7, 8, 10 and on. Rarely do we get two consecutive chapters. Often, the setting and situation in one strip is totally different in the next. They are all wonderfully made and left me desperately wishing for those missing strips. Oh, if only someone out there at a complete run of Mickey’s Quest. Chuckle. Mickey’s Craziest Adventures is tremendous fun. It will confuse the heck out of younger readers, but us veteran Disney fans will find it amazingly entertaining. Since reading it, I have returned to it on several occasions, just to marvel at this strip or that strip. This book ties for my pick of the week. 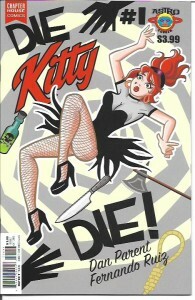 The only comics I read this week that could equal the sheer joy of the above book were Die Kitty Die! #1-4 [Charterhouse Comics; $3.99 per issue) by Dan Parent and Fernando Ruiz. These two veterans from Archie Comics have crafted a series that has all the charm of the best Archie comic books of the 1960s and 1970s, a thoroughly modern sensibility, some of the sexiest art this side of Dan DeCarlo and more than a little commentary on the vagaries of comics publishing in the 2010s. Kitty is a beautiful, big-breasted witch who has been appearing in her own comic book for decades. Somehow, the events of her comics also happen in her real life. For example, Kitty Comics has married her five times to five different husbands to increase sales. These marriages don’t last, but her ex-husbands are still around. Kitty Comics has also published the adventures of cartoon characters who parody Casper, Hot Stuff and Richie Rich. This was makes perfect sense when you read these issues. The title comes from the latest Kitty Comics plan to raise sales. They want to kill Kitty and replace her with the nastier Katty. To achieve this goal, the company has offered to reward whoever kills Kitty with the return of their own comic books. There’s so much to love in these issues. Each of them leads with a “reprint” of an earlier Kitty story. Kitty hangs out with a bunch of comics fans at a comic-book shop. There are pin-ups and fashion pages and faux advertisements. Simply put, these four issues are a sheer delight. They had me smiling from start to finish…and for a few hours beyond the finish. They have be smiling now because I know you’ll love them as much as I do. Kudos to Parent, Ruiz and the league of co-conspirators in comics fun: Rich Koslowski, J. Bone, Glenn Whitmore, Janice Chiang, Gisele Lagrace and Bill Golliher. Their work deserves to be named a pick of the week. A trade paperback collection of the four issues is due this month ($24.95). I recommend it highly. Joy informed my choices for picks of the week, but not every comic book is going to be an uplifting romp. 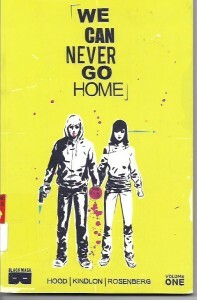 We Can Never Go Home Volume 1 by writers Matthew Rosenberg and Patrick Kindlon with art by Josh Hood and Brain Level [Black Mask; $9.99] is the pretty grim story of two young people who make bad decisions. Teenage misfits Duncan & Madison are on the run. The only things they can count on are their super powers, a handgun and each other. Duncan and Madison are engaging protagonists. I wanted to like them and I did, only to be taken aback by their propensity to make some of the worst decisions in the history of worst decisions. Nothing goes as they plan. Violence and death are their companions on their journey. The ending of this first volume – first are planned – has them in circumstances much less than they would like. The writing and story are a wee bit choppy in places, but I think this is, overall, a terrific graphic novel or portion of a terrific graphic novel. The art is personal and powerful. The characters are believable and interesting. The action sequences are exciting and gritty. The ending left me unsatisfied, but, knowing there are more volumes to come, pleases me. I’m sticking with this one. We Can Never Go Home is not a comic for younger readers, though I think it will resonate with older teens and even old farts like me. I recommend it. I’ll be back next week with more reviews.